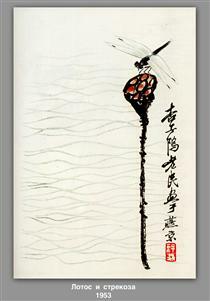 Qi Baishi (1 January 1864 – 16 September 1957) was a Chinese painter, noted for the whimsical, often playful style of his watercolor works. 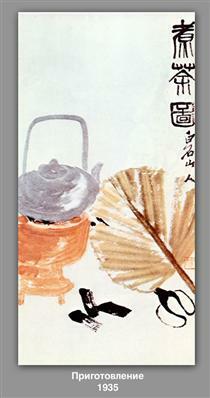 Born to a peasant family from Xiangtan, Hunan, Qi became a carpenter at 14, and learned to paint by himself. After he turned 40, he traveled, visiting various scenic spots in China. 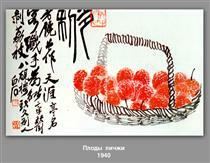 After 1917 he settled in Beijing. 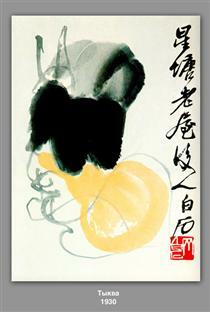 His pseudonyms include Qí Huáng (齊璜) and Qí Wèiqīng (齐渭清). 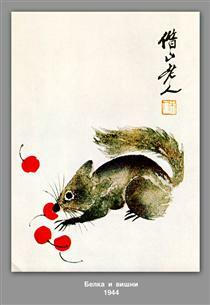 The subjects of his paintings include almost everything, commonly animals, scenery, figures, toys, vegetables, and so on. He theorized that "paintings must be something between likeness and unlikeness, much like today's vulgarians, but not like to cheat popular people". 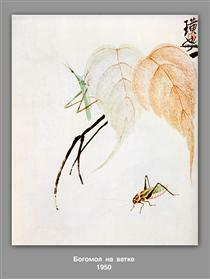 In his later years, many of his works depict mice, shrimp or birds. 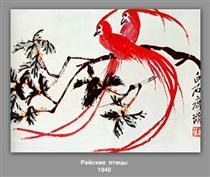 In 1953 he was elected president of the China Artists Association. 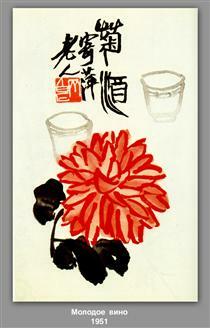 He died in Beijing in 1957. He was born in Xiangtan Hunan and grew up in a family of low-income background. He lived with his parents, grandparents, and eight younger sisters and brothers. 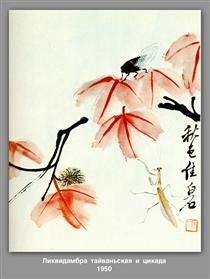 Qi Baishi was schooled for less than a year due to illness. However, he was too weak to do much of the work and this was when he became a carpenter. 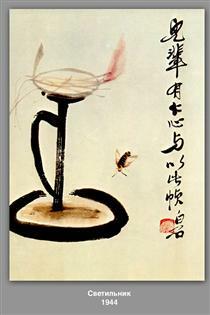 While Qi Baishi was growing up, he came upon a Chinese manual of painting, this was what sparked his interest in art and painting animals, insects and other types. 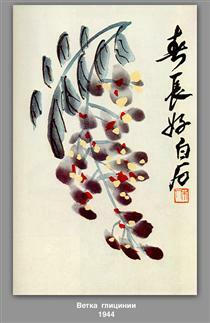 In his painting, depict things that people have seen however, he didn’t start following this motto until much later in his life. 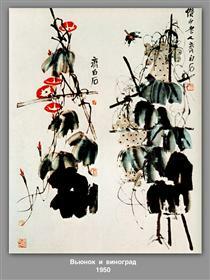 He first studied the "Manual of the Mustard Seed Garden" (芥子園畫傳) and used performers, mainly opera, for models to practice his work. 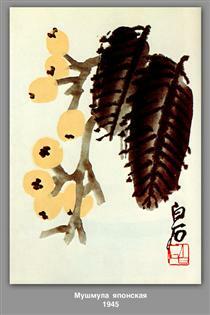 After using opera performers as models Qi Baishi turned to anyone he knew to pose for him. 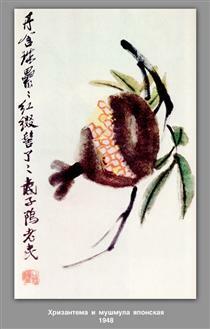 “Qi Baishi started receiving artistic training from Hu Qinyuan which consisted of fundamentals in gongbi mode, which features fine brushwork and meticulous detail” (Jung Ying Tsao p. 199). He was taught that every aspect of painting mattered, from the subject matter to the way the paint was applied to the paper. 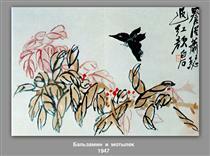 His landscape paintings came as a result of his next mentor Tan Pu. 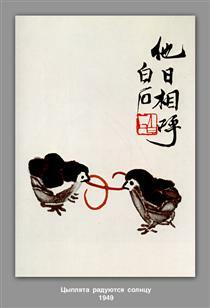 Because of his training, he then realized that he could pursue art as his full-time career instead of just dreaming to become a professional artist (Jung Ying Tsao p. 199-201). 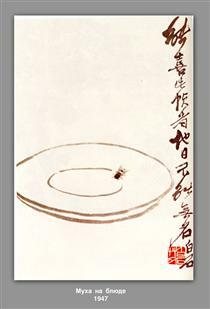 Despite his training in gongbi, Qi is famed for painting in the freely expressive xieyi (寫意 ‘sketching thoughts’) style. 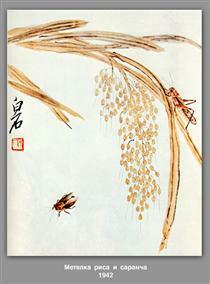 Baishi was popular for his variety of works ranging from plant to animal life; because of his natural style, collectors both “artistic and political” purchased his work. 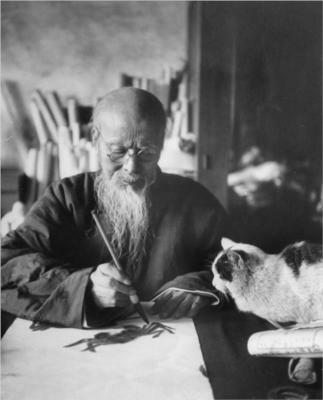 According to the article, Qi Baishi [Ch’i Pai-shih; zi Huang; hao Baishi Laoren, Baishi Shanqeng]: "Baishi’s works were based on his life and his character. 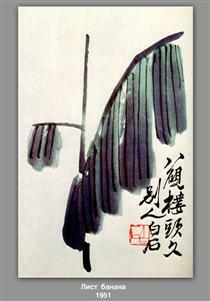 After the fall of the Qing dynasty Qi Baishi was known for not letting all the political issues affect his work and keeping his own values and ideas through the harsh times. 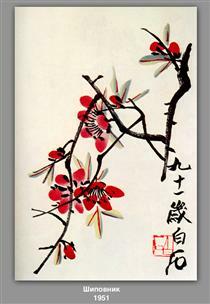 According to Confucian standards, starting off as nothing and creating a name for yourself, as Baishi did, was very honorable (Xiangtan p. 1).